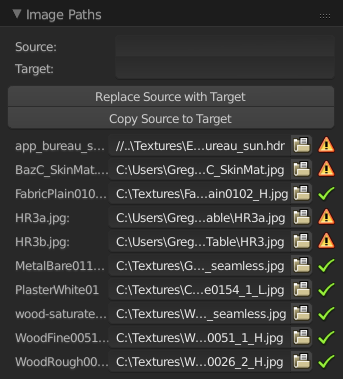 Blender will only list missing files and offer a simple find missing files, so I do think the ability to adjust the path of each resource will improve on that. I would add a button to list all assets that when off will only lists missing files. Caching results would help so a button to update/rescan. Blender’s find missing files thing is actually really good – you don’t have to choose the exact file, just select any folder (even just the root of your hard drive) and it’ll scan all files in all subfolders for the missing file (assuming the name is unchanged). I don’t see the point in being able to find missing files one by one using my add-on anymore. Deleting images permanently in python is not stable at all last time I checked. It can be done, but iirc can easily cause crashes. A pack/unpack button would be great I agree. Not sure if it’s possible though.